Family: Fabaceae Lindl., genus: Pisum L., species: Pisum sativum L. - Cherepanov S. K., 1995. Pisum sativum et P. arvense L.; P. humile Mill. ; P. umbellatum Mill. ; P. uniflorum Moench; P. biflorum Stokes; P. saccharatum Ser; P. vulgare Jundz. ; P. leptolobum, P. ramulare, P. quadratum, P. umbellatum Reichenb. ; P. vulgare Fingerh. ; P. baclium, P. borussicum, P. chlorospermum, P. coerulescens, P. excorticatum, P. fertile, P. macrospermum, P. praecox, P. prolificum, P. roseum, P. rugosum, P. saccharatum, P. sibiricum, P. smyrnense, P. viride, P. zeylanicum hort. (Steud. Nomencl. ed. 2); P. gullosum Risso; P. pachyloobum et P. speciosum Dierb. ; P. sativum Alef. ; P. macrocarpum Ser. ; P. tetragonum hort. ; P. commune Clav. ; P. sativum ssp. P. arvensis et subsp. hortense Asch.-Gr. ; P. sativum ssp. Commune (Clav.) Gov. Chromosome number: 2n=14. The pea plant is an herbaceous annual. It has a tap root which penetrates the soil to depths of 1.5 m. Its lateral roots are located inside the arable soil layer. Nitrogen fixers such as Rhisobium genus bacteriae thrive on pea's roots in perfect symbiosis. Pea stalk is tetrahedral, hollow, simple or fasciated. The stalk's height enables us to distinguish between dwarf (up to 50 cm), half-dwarf (51-80 cm), medium height (80-150 cm) and tall (150-300) pea varieties. Pea stalk is somewhat faceted, weak, and trailing. Only standard pea varieties are erect prior to their seeds' maturity due to their clinging tendrils. Pea stalk branching may be of two kinds: near the base or in the axils along the stalk. The plant is usually covered with a waxy film, but some varieties have no film. Pea leaf is complex. It usually consists of a petiole, 2 or 3 pairs of leaflets and an odd number of tendrils (3 or 5, sometimes 7). Some pea varieties have other kinds of leaves: pinnate, when leaves have no tendrils and end in an unpaired leaflet; leaves with tendrils (without leaflets), when imparipinnate tendrils are formed instead of leaflets; or multi-imparipinnate, when leaves have a multi-branched leaf nerve ending in 3 to 5 very small leaves. The varieties that exhibit the two latter leaf types have been recently bred. Pea's stipules are larger than its leaflets and are half-heart shaped. Some mutants have been observed with fully or partially reduced stipules. Pea inflorescence is an auxiliary raceme. In fasciated varieties, it is a polychasium. Pea flowers are butterfly-shaped and of different size (1.3 to 3.5 cm). Pea plants that are cultivated for their seeds or for human consumption have white flowers; those cultivated as fodder or for green manure have pink, reddish or purple flowers. The number of stamens is 10. One of them is free and closely adheres to the ovary. The other 9 are accrete and form the androphore. Pollen grains are of two kinds: round and oblong. The ovary is almost sessile. The number of ovules is 10 to 12. The fruit is a pod consisting of two valves, whose shape allows us to distinguish between hulling and sugar pea varieties. With the former variety, the pod's valves have a parchment film and easily split in half when ripe. With the latter variety, pods have no parchment film, and their threshability is poor. Pea pods may be of different shape and size. They are usually cylindrical, bulging while ripening, bare, with a short and curved rostellum. Pea seeds are spherical, smooth or wrinkled (marrow). Each seed consists of an embryo and the testa. Under the testa, there are two seed-lobes, which remain in the soil when seeds germinate. Pea seeds may be of different size, shape and color. Their cicatricula is light colored, brown or black. Among the varieties that have been bred, there are some that have no cicatricula because their funicle is accrete with their testa. Therefore, they do not shed their seeds. Garden pea plants thrive in moderate climates. They are a spring or winter crop, hygrophilous and quite cold resistant. The lowest germination temperature for pea plants is 1 to 2°C; the optimal germination temperature is 18 to 25°C. Pea sprouts may survive short frosts of 4 to 6°C. The usual temperature for vegetative organs' formation is 12 to 16°C; for generative organs' formation, the usual temperatures range from 16 to 20°C; for pod growth and seed ripening, temperatures from 16 to 22°C are necessary. At 25°C, pea plants. growth slows down, and at temperatures above 35°C, it is inhibited. The vegetation period lasts 45 to 120 days or longer. Pea plants thrive in loamy, subacidic or neutral soils with good aeration. The optimum humidity is 80% of full soil humidity ratio. Pea plants suffer most from lack of moisture during their phases of development from the beginning of their generative organs' formation until full flowering. Pea plants prefer long daylight, but there are varieties with different photoperiodic reactions that are closely related to daylight spectrum's composition. Long-wave light favors pea plants' development. Pea plants are self-pollinating. As a rule, pollination occurs inside a closed flower bud. Its timing depends on the features of specific varieties. With Mediterranean and European varieties, pollination has been observed when corolla's pistils have already straightened out and half emerged from behind their calyx's denticles. With Asian varieties, pollination has been observed earlier. Pollen begins to germinate in approximately 15 to 30 minutes' time. Fertilization occurs 3 to 5 hours after the pollen sets on the pistil's stigma. Cross-pollination has sometimes been observed in hot and dry weather, but its probability is below 1%. Pistil's stigma of pea plant is viable for 8 to 10 days. Flowering lasts for 3 to 40 days depending on the variety and cultivation conditions. Fasciated pea varieties blossom more intensively, but their seed yield is very low. On each plant, the first to blossom are the flowers of the bottom fertile node. Pisum L. genus is very supple. The southernmost P. Fulvum species has adapted itself to a very dry, subtropical climate of the Eastern Mediterranean and even to the conditions of the Yemen plains. It has developed geocarpy. Its pods are not only protected from evaporation but can also be easily buried in the soil. At the other end of pea's ecological range, there are two alpine species which are now perennial in mountain environments and have lost their tentacles. P. Elatius species is typical of medium and low altitudes in the mountains and lowlands. Outside its natural habitat in the meadows, it has adapted itself as a weed among cereal crops. It self-seeds before the harvested grain develops a deteriorating grain quality. Standard pea varieties are the result of a radial fasciation. The species of the Pisum L. genus easily interbreed. Peas are an ancient, Old World plant. It is originally from the mountainous areas of the Levant, Central Asia and Abyssinia. This has been demonstrated by the existence of primitive pea varieties and a great concentration of dominant genes. Wild-growing pea plants have not been found. Pea plants have been sown since the 4th millennium B.C. Cultivated peas were introduced to the north from the south of Russia, as is demonstrable by archaeological finds in Chernovtsy and Ivano-Frankovsk regions (the 3rd and 2nd centuries B.C.). Presently, pea plants are successively cultivated in areas with varied climatic and soil conditions. The bulk of pea plants cultivated in Russia are found in the Middle Volga Region, in the Central Black Earth Belt, in Tatarstan and in Bashkortostan. Abroad, cultivated peas occupy great territories in China and India. In Europe, pea plants are cultivated in the Netherlands, Germany, Poland, the Ukraine, etc. 87 varieties of cultivated peas were approved for cultivation in various regions of Russia in 2004 (Aksaysky Usaty 7, Albumen, Batrak, Varyag, Multik, Neosypayushchiysya 1, Madonna, Nord, Samarets, Tatarstan 2, etc.). The breeding agencies include: Don zonal Research Institute for Agriculture, All-Union Research Institute for leguminous and cereal crops, Urals Research Institute for Agriculture, Breeding Station in Krasnoufimsk, Siberian Research Institute for Agriculture, V. V. Dokuchayev Central Black Earth Research Institute for Agriculture, N.M. Tulaykov Samara Research Institute for Agriculture, etc. Peas are a staple leguminous cultivated plant. Peas are used as a field crop in 3 main areas: human consumption, livestock fodder and as a source of hay. Peas are very widely used because of their seeds' high protein content (on average 20 to 27%), their balanced amino-acid composition, good taste and digestibility, as well as because of pea plants' high yields in the areas of their cultivation. Peas are a food crop very high in proteins. However, their biological value is not high because of their low methionine and tryptophan content and because they contain proteins which inhibit the enzymes of the digestive system (tripsin, chemotripsin, and lectins). Pea seeds are processed to produce cereal, flour, green peas, and peascods. In the past few years, pea plants' value as a source of grain fodder, green fodder, silage, hay, and haylage has greatly increased. Pea seeds are widely used in the feed mill industry. One fodder unit of peas contains over 150 g of digestible protein. Introduction of peas into livestock fodder greatly reduces fodder consumption and, consequently, the cost involved in livestock breeding. Requirements for the quality of pea seeds used as fodder are less strict. Such pea varieties can have seeds of different size, even though small seed size is preferable, as it reduces the consumption of seed material. The main feature of pea plants used for hay and fodder is their high rate of vegetative mass accumulation, since the vegetative mass contains 18 to 22% protein, a large number of leaves, a low percentage of cellulose and small seeds. As these pea varieties are often cultivated together with other crops (oats, sunflower, etc. ), it is important that pea plants' development phases coincide with corresponding development phases of those crops. Pea plants, with their ability to fix nitrogen, are very important for land treatment. They are the best precursors for other crops. In some areas, they are used as green manure. In southern areas, they can be grown as an intermediate crop and can produce 2 to 3 harvests from the same plots of land. The best precursors for cultivated peas are tilled crops (maize for silage, sugar beet) and winter grain crops, as well as spring wheat. 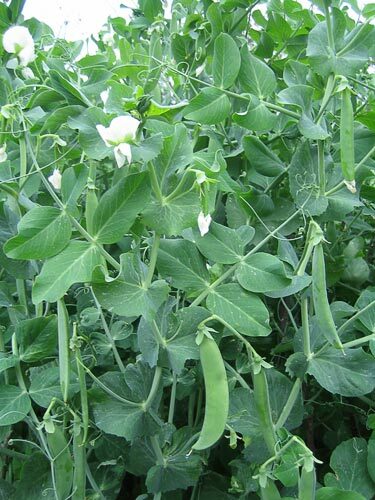 Pea plants readily respond to phosphate and potash fertilizers with up to 130 kg of PK per hectare. Pea seeds are sown early in the spring (in wet areas in a mix with oats, etc.) with the use of closed drill or cross drill techniques. 150 to 350 kg of seeds are planted per hectare at depths of 4 to 10 cm. Peas are mainly harvested using two-phase techniques. On average, pea seeds yield 1,500 to 2,000 kg of seeds. Most pea varieties cultivated for their seeds tend to have tall stalks and lodge. Breeding relatively short-stalk varieties with optimum foliage is an important breeding task. Pea varieties cultivated for human consumption must meet strict requirements as per their quality, i.e. size, shape, color and uniformity of their seeds. The best varieties have big, spherical, and highly uniform (80 to 96%) seeds. Industrial treatment requires certain technological features of pea seeds: cereal yield and yields of hulled and crushed material. Seeds must be uniformly colored. Yellowish-pink color is preferable. However, varieties with green-colored seeds are preferred in areas with a short frostless period and a lack of heat, as they allow improvement of the appearance of the product, while yellow seed varieties often require harvesting when unripe (with a greenish cast). Intensive cultivation and harvesting techniques that require a number of machines and implements have been introduced. They include sowing pea seeds on well-ameliorated lands, maximum weeding of fields at the time of sowing, leveling the soil prior to sowing, a rational use of fertilizers and liming of acidic soils, thorough preparation of seeds for sowing (treatment with pesticides, treatment with molybdenic and boric chemicals, etc.). Konovalov Y.B., ed. 1990. Particular Breeding of Field Crops. Moscow. pp. 216-235. State Register of Breeding Achievements Approved for Practical Application in the Russian Federation in 2004. Moscow: 2004, pp. 19-20. Suvorov V.V. 1961. Botany. Leningrad. pp. 303-304. Zhukovsky P.M. 1971. Cultivated Plants and Their Congeners. Leningrad. pp. 330-334.